At least yours isn't licking your eyelids to get your eyes open!!! Love your work!!!! Oh man, my tortie, Moxie, does that. It's pretty much the only way she cuddles. Kitties! My black cat used to make a nice nest of my hair while I was sleeping, then curl up on it. I don't understand, sitting on our heads is like sitting on a bowling ball. No one in our family does this, but our tortleshell meezer loves to try to eat my hair. She must like the fragrance. I love it!! It's so real my cat does that every night, I woke up at some point and there he is, sitting on half my pillow, half my head! Indeed. I don't mind my kitty walking over me. Well, our heads give off a lot of heat, so it makes sense. 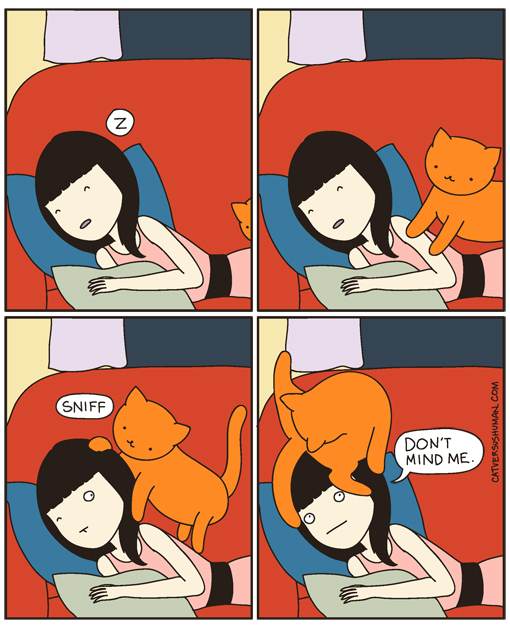 I will state that I have never had a cat sit on my head or hair. I think I am happy with that status.